As a fundamental unit of life, a cell is comprised of numerous different types of molecules that form intricate interaction networks, which function collectively to give the cell its life. Dissecting the inner workings of a cell thus requires imaging methods with molecular specificity, molecular-scale resolution, and dynamic imaging capability such that molecular interactions inside the cell can be directly visualized. 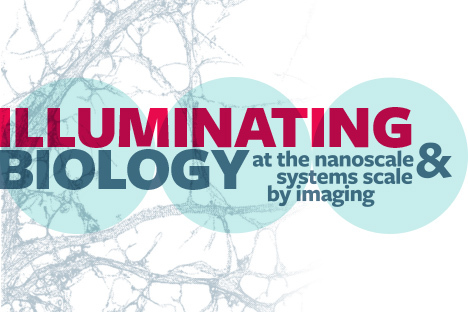 However, the diffraction-limited resolution of light microscopy is substantially larger than molecular length scales in cells, making many sub-cellular structures difficult to resolve. Another major challenge in imaging is the low throughput in the number of molecular species that can be simultaneously imaged, while genomic-scale throughput (i.e. the ability to simultaneously image thousands of molecular species) is needed for investigating systems level questions. In this talk, I will describe two imaging methods that we developed to overcome these challenges and biological applications of these methods. I will first describe STORM, a super-resolution imaging method that overcomes the diffraction limit. This approach allows multicolor and three-dimensional imaging of living cells with nanometer-scale resolution. I will present both technology development of and biological discoveries enabled by STORM. I will then describe MERFISH, a single-cell transcriptome and genome imaging method that enables mapping of the spatial organization of the transcriptome and genome inside cells and the organization of distinct types of cells in complex tissues.